With no car to take this year it seemed a little strange, but we made the decision to part with our 'toys' last year. All they really did was sit in the garage gathering dust, all forlorn, as they were better being owned by someone who was likely to use them more - after all that's what they are for, aren't they - we parted with our Fiats. Anyway, back to the plot. Mel and I arrived Friday teatime with Mel at the wheel of the camper, severe sunburn two weeks previous in France meant I was still a bit incapacitated and couldn't drive. We were welcomed at the site by the usual motley crew all very eager to take our money off us, and after signing in we headed off to find a pitch. The field looked very colourful, with tents, caravans and motorhomes scattered all around the site - oh and the odd Microcar or two, or three, or four ... We pitched up next to a new member and his wife who straight away offered a beer - nice chap and chappess!! The girls got together and had a 'women only' meeting in the camper whilst I sat drinking my beer in the sunshine resting my legs which were well covered up - yeah we had REAL Yorkshire sunshine and loads of it! The usual "Hello", "How are you" and "Hey up chuck" followed with a few more beers, a BBQ and a little walk round the 40+ other micronuts looking at the cars which ended the night off nicely for us. A few souls sat and nattered in the "conservatory", but us oldies retired a little earlier. Saturday and another fine sunny day - absolutely brilliant. No car meant that we were going to have a nice quiet day pottering in the sunshine, something we hadn't done for years, and apart from rescuing Terry's gazebo from blowing away the first time (it nearly managed it later) it went as planned. Paul had organised a treasure hunt for this year's run, something a bit different, it also meant people could do it in little groups, or on their own, or just do their own thing generally. Just a nice relaxing day for everyone, even the one's who managed to complete the treasure hunt - Paul did say that unless people planned it well it was either 15 miles or 50!!!!! After freshening up it was time for the usual Micro Maniacs Rally grub of the 4 Ps - pie, potatoes and peas then pudding! At 6.00 o'clock on the dot (as we were instructed), we duly lined up for the regular meal, and dashed quickly to the tables to scoff up, Mel had made some gravy and our table was very popular as we were inundated by requests for some of it! A nice trifle for pudding rounded it off then it was time to sing "happy birthday" to a couple of members, didn't ask their ages of course but they must've been only 21 again ... honest! Then the fun and games started. Tom did his entertaining quiz first (more like torture at times! ), which we all cheated at, but still didn't win. Then we were put into teams and several assorted games were brought out to entertain us such as boules, hoop-la, skittles, pinball, shove ha'penny (well, a 10 penny piece now), magnetic darts and one that proved quite popular the 'guide the hoop round the wire without touching it thingy that makes a noise when you do touch, the difference being that it was based on a picture of a male model and it was fun to hear what he said when you did touch so the ladies were quite eager to have a go! All the games entertained us for ages, it was getting dark when John had to call an end to all the fun and games at around 9.00 - we would probably have gone on all night! There were some games we never even got time to have a go at - it was total organised chaos but very GREAT fun. Paul had an alternative bit of entertainment - one young lady had dropped her engagement ring so he went and got his metal detector to try to find it, thankfully the ring was found although not where he was looking but at least it gave him a chance to play with his "toy"! Things settled down a bit then so we had a few beers and a natter followed by another tour of the site to see who had arrived earlier, before getting off to bed - happy and contented. Sunday and you guessed it another SUNNY day, and to think the forecast had been it a bit iffy, still we weren't complaining. We had brought a few things to sell so Mel set up stall and cajoled people into making a purchase as they went by, and a sterling job she did. 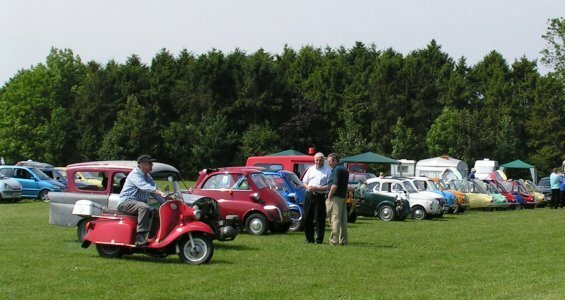 A few others also set up tables round the field as the cars slowly lined up in the centre ready for the judging. A few other cars turned up for the day, and counting a couple of scooters I think the number of vehicles was somewhere in the forties, a nice turnout. The only question is though where have the Bond's and Isettas gone? The days when that was all you saw is now a distant memory - are they all in hiding? Come on, get 'me out and let's be seeing them in the flesh (your car that is! ), still it was a nice showing with plenty of variety. There were quite a few dogs at the rally as well, our 2 even had their own tent (no we're kidding, we're not that sad ... really, we were trying to sell it! ), another dog, Star, had just had of enough of pottering around so decided to do a bit of sunbathing herself to try make her underneath match her back. The morning drifted lazily into afternoon all to quickly and we were soon invited to make our way up for the raffle and prize giving. The Fiat 126 Cabriolet of Dave McNeice took best metal, the Grot Award went to who else but Mark Fisher for his rusty Heinkel, and I can't remember the rest, but the Heinkel winning the best plastic (??) really made us laugh. The Reliant Rialto/van/camper/roof box thingy of Jason took the Peoples Choice Award, and Best in Show as well - it was, how do I put it, err ... different but brilliant! The show was over for another year, it was nice to see old friends and make new one's, a nice relaxing weekend, lots of fun and the weather - well what can I say, it just put the cherry on the top. Congratulations to all for helping to make it a great weekend and we're already looking forward to next year.